It’s Valentine’s Day, one of Geraldine’s favorite times of year! She gets out her very best glitter to make cards for her family and friends at school, trying extra hard to think of ways to showcase all of their special qualities. But when Gerry gets to school and realizes she accidentally took a folder of Daddy’s work papers instead of the cards she worked so hard on – oh no! – she can’t help but be disappointed. Thankfully, her teacher helps her find an extra special way to celebrate the inner sparkle of each of her friends. 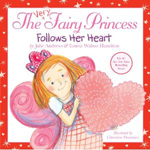 Another heartwarming Very Fairy Princess adventure from bestselling mother-daughter team Julie Andrews and Emma Walton Hamilton, beautifully illustrated by Christine Davenier.